High Velocity. By Louis P. Burns aka Lugh ©. All Rights Reserved. Additional online literary editing by Catherine Edmunds. ^ Click the title of this poem up above to watch the updated version of the video for it on our offical upstaterenegadeproductions.com domain. By Louis P. Burns aka Lugh © 2001/2004. All rights reserved. Additional online literary editing by Catherine Edmunds aka delph_ambi. and someone screamed; oh jesus! High Velocity is a political video-poem written by Louis P. Burns aka Lugh as part of a series of creative writing masterclasses facilitated by David Gothard (former artistic director of Riverside Studios, London) while he worked with various performance artists and writers at the Playhouse Theatre and Resource Centre - Derry, Northern Ireland. 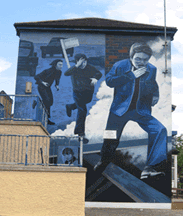 First mural by The Bogside Artists, Derry. Photograph by Diarmuid McGowan © for Upstate Renegade Productions, Derry - 2007. High Velocity is the first completed e-poem by Upstate Renegade Productions. We're currently working on a comedy piece called The Gadget's Man, but High Velocity is one of our more serious productions. 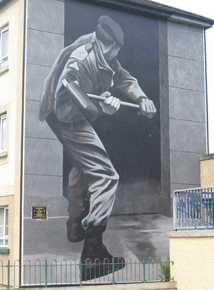 The aim of High Velocity is to address the similarities between what happened in Ireland/Northern Ireland under illegal British military occupation/rule with what is currently happening in the Middle East under the tyranny of America and Britain. The poem is written from the perspective of someone who finds themself driven to fight back militarily against this occupation. Please note that High Velocity is a creative new media arts production only and not necessarily the political view of the artists/editors/promotors involved in its content or production. All stills images (in the video) were gathered from open source internet search engines via AltaVista, Google, MSN and Yahoo. High Velocity is subject to international copyright legislation. Louis P. Burns aka Lugh / Upstate Renegade Productions © 2001/2004/2008. All rights reserved.